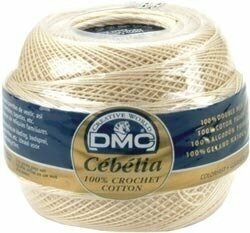 Cebelia is a superior 100% cotton, three-cord, tightly twisted thread available in three sizes. Designed to be used wherever a sized cotton is recommended. It is wound on a small core resulting in a compact ball with high yardage. Size 30: 563 yards.